For volunteer English teacher Robin Hudson, learning is a two way street! This month’s volunteer spotlight is on Robin Hudson. 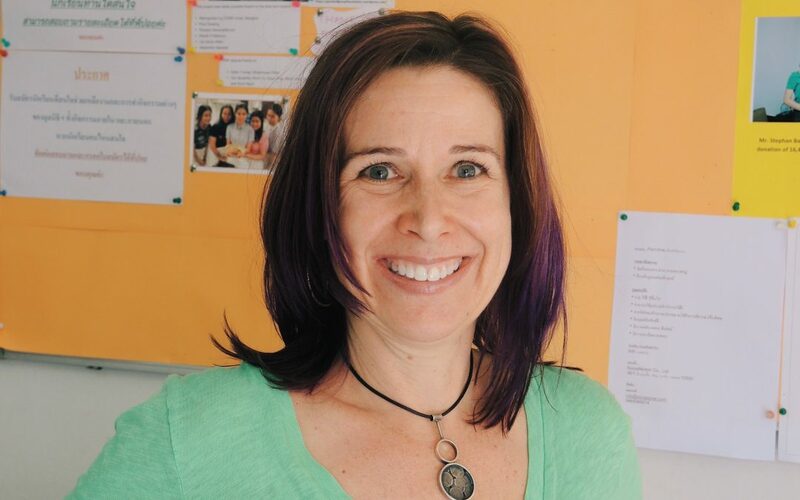 Having moved to Bangkok in 2011 from Phoenix, Arizona, she signed up as a substitute English teacher. Two years later, when a class she was substituting for lost its regular instructor, she took over permanently and has been helping this group of 8 women advance their English skills ever since. She is a strong believer that class environments should be just as fun as social ones. Creating innovative ways of learning, she develops quizzes, sets Youtube videos as homework assignments, and even organizes decorating parties and outings. Her first favourite aspect about working at Pratthanadee is seeing her students showcase their newfound confidence. When struggling to explain the difference between “simple past” and “present perfect tenses,” one of her shyer students raised her hand and was able to explain it to the class. “I was so proud of her, not only for knowing the correct answer, but for being confident enough to speak up,” says Robin. Her second favourite is the strong bond between her and her students, who she looks forward to studying with every single week. Other than volunteering at Pratthanadee, she is an active member of the American Women’s Club of Thailand, a social group based in Bangkok which provides scholarships to young girls in rural areas of the country, enabling them to complete secondary school. Pratthanadee Foundation empowers women and girls from impoverished regions across Thailand and provides them with tools to build safe and successful lives. Click here to learn more about opportunities to volunteer and help create brighter futures for women and girls.